A young Dallas Cowboys fan prepares to eat turkey with his mom during a tailgate party at Texas Stadium before 2004’s Thanksgiving game between the Chicago Bears and Dallas Cowboys in Irving, Texas. Detroit Lions fan Brent Clodgio of Canton, Michigan, celebrates with a deep-fried turkey before the Detroit Lions-Green Bay Packers game on Thanksgiving 2011 in Detroit. On Thanksgiving Day 1892, the Allegheny Athletic Association — featuring the world’s first professional football player, William Heffelfinger — beat the Cleveland Athletic Club with a single touchdown, by a score of 4 to 0. Back then, field goals were worth five points — meaning, yes, a field goal was worth more than a touchdown — and the forward pass was illegal (it wouldn’t be allowed for an additional 14 years). In other words, teams have been playing football on Thanksgiving since long before it was football as we know it. The NFL has embraced that tradition since its inception. The NFL played six Thanksgiving Day games in its inaugural year of 1920 and has played games on the holiday every year since (except from 1941 to 1944, during World War II). So, as we prepare to stuff ourselves with turkey and ham, and sneak away from relatives to watch some gridiron on the big screen in our uncle-in-law’s den — we’ll be doing Skeptical Football a little differently, with historically oriented previews for each of the day’s games. The Detroit Lions have been playing home games on Thanksgiving since 1934 and haven’t taken the holiday off since 1945. Their inaugural home game was against these same Bears, who won 19 to 16. Eighty years later, the two teams are back for more. The Bears have a rich 30-year history, dominating the game under George Halas, winning the very first NFL championship in 1933, drubbing the Washington Redskins in 1940 by a record score of 73-0, and amassing four championships under star quarterback Sid Luckman. But in the 60-plus years since, the Bears have struggled. Since 1950, they’re down in cumulative point differential overall, and in 2011 they gave up their all-time margin of victory throne to the Green Bay Packers. The Lions had a promising start in the NFL, winning a famous “iron man” game in 1932 (in which they beat the Packers with only 11 men playing and with no substitutions), and winning a championship with QB Dutch Clark in 1935. 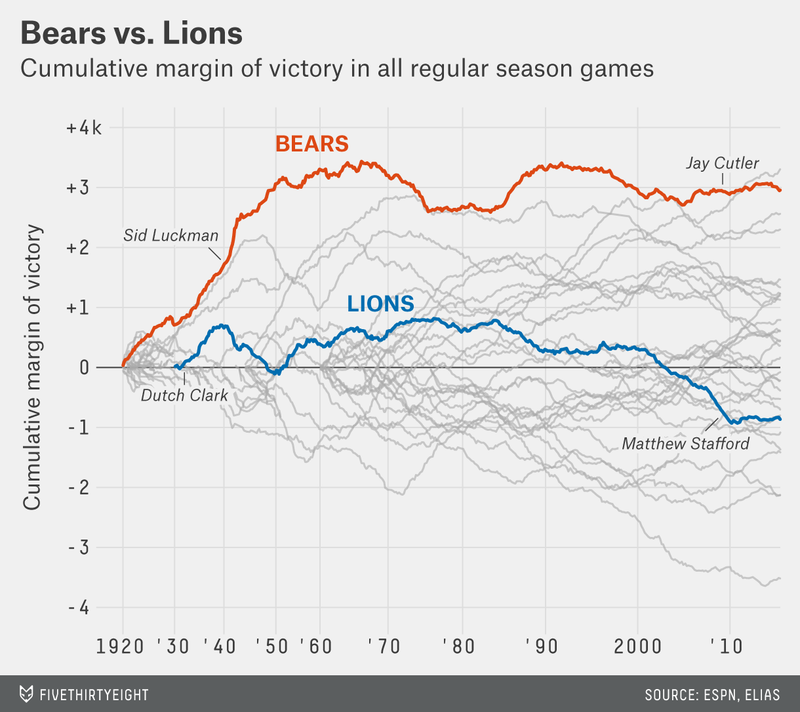 But since the 1940s, the Lions have mostly tread water or gone downhill. Things have looked a bit better for the Lions in the Matthew Stafford era, and this season started out very well. Although they have lost their past two games (to conference leaders New England and Arizona), they enter this matchup two games ahead of the 5-6 Bears, they’re playing in Detroit, and they have an SRS2 advantage of 6.8 points (meaning they’ve been nearly seven points per game better). But it’s hard to know that much about the teams after only 11 games, and their franchise histories have been average for the past few years. So, to get some more insight into Thursday’s game, let’s focus on the QBs. 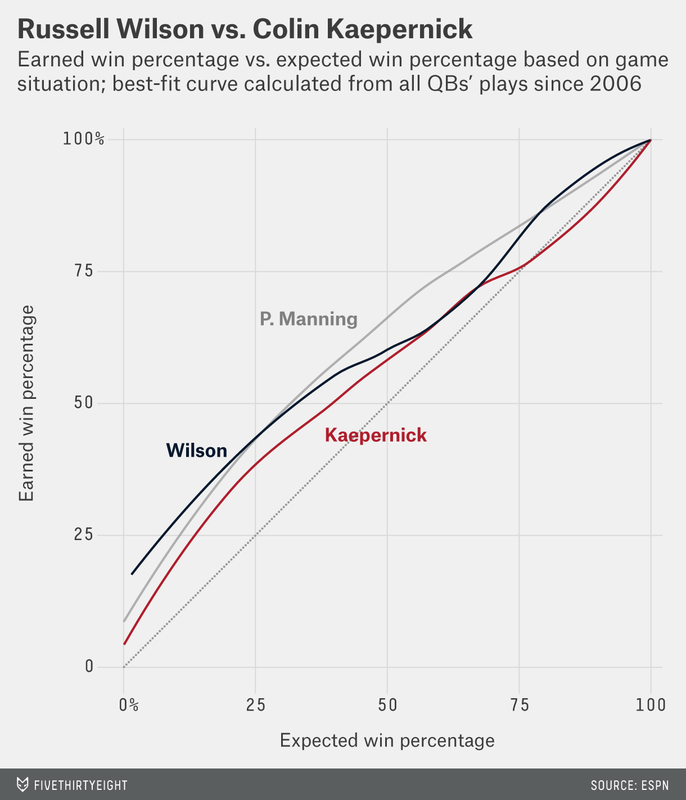 A few weeks ago, I introduced my experimental QB “win curves,” which compare a QB’s expected win percentage to his actual win percentage at any given point in the game. One of the craziest of these win curves was Matthew Stafford’s — which indicated that he won way more than he was expected to when his team was trailing, but lost way more than he was expected to when his team was ahead — and he had easily the most extreme such effect in the league. 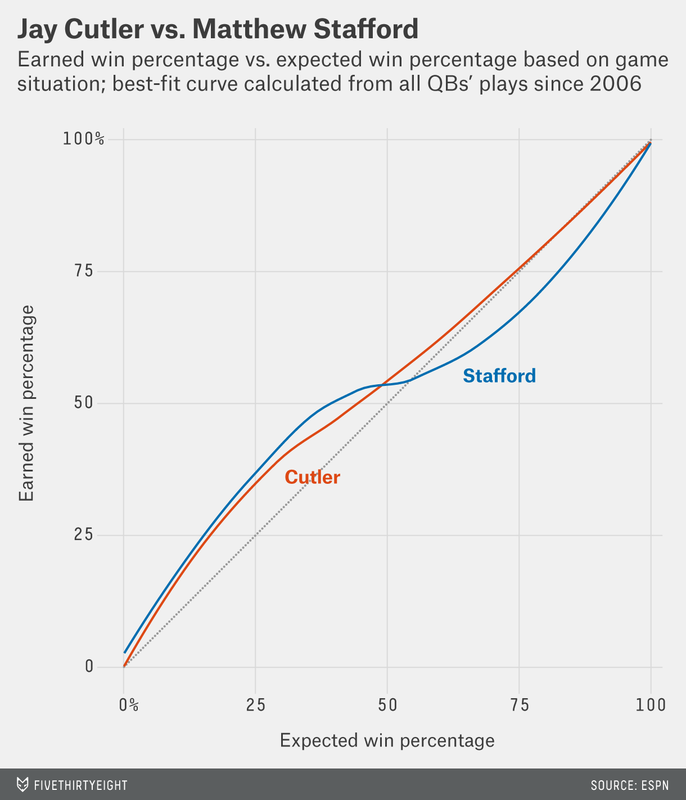 The magnitude of the curve is a bit less extreme (particularly Stafford’s habit of losing in what should be winning spots), but the basic phenomenon remains: Stafford appears to be much better at coming back than he is at holding on to wins. 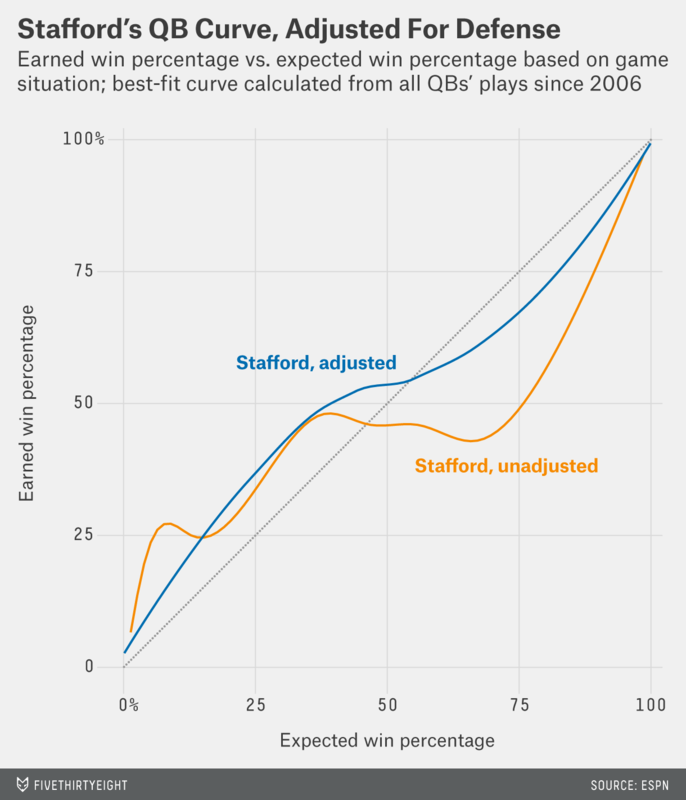 But more importantly: Stafford’s “adjusted” curve increases continuously, meaning the Lions no longer have to consider falling behind just so they can win. Get ready for some excitement, as both of these guys have been better at digging out of holes than at burying their opponents. During the Tom Landry/Roger Staubach era, the Cowboys had one of the most dominant runs in the post-merger NFL. Then, after a brief slump in the late 1980s, Jerry Jones seemed to have the team back on its winning track under coaches Jimmy Johnson and Barry Switzer, and the potent QB/RB combo of Troy Aikman and Emmitt Smith.5 Since Aikman’s retirement in 2000, however, Jones’s squad has struggled to recapture its old magic. And that’s despite Tony Romo. Although I love watching Romo play and usually I’d wager that he is a very good quarterback, the Cowboys experienced only a modest bump in their historical chart since Romo has been under center. And though judging an individual based on team performance is somewhat unfair, having pored over these charts repeatedly for weeks, I’ve noticed that the arrival or departure of a top QB normally has a pretty noticeable effect on his team. It may not be enough to make an awful team a winner, but there is usually some kind of turn (like with Stafford). Or, for example, with Donovan McNabb and the Eagles. Or Nick Foles,6 my gunslinger of the first quarter. In Foles’s short tenure, the Eagles have been on a nice upturn, but unfortunately he will be out of this game. 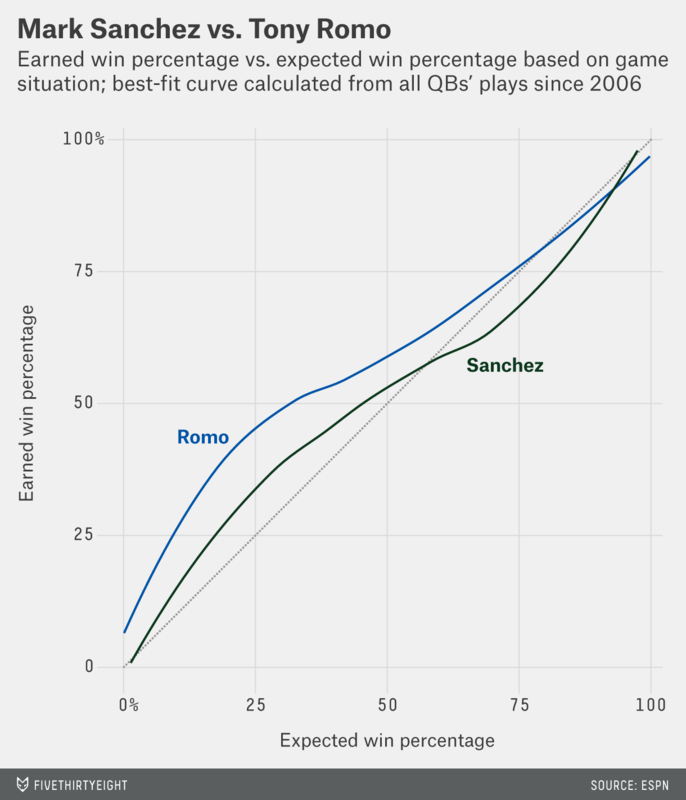 So, the Eagles will rely on Mark Sanchez (someone who didn’t move the New York Jets’ chart much) to take on the enigmatic Romo, our gunslinger of the first half of the season. How do these two stack up on the win curve scale? Sanchez came out looking surprisingly OK in the chart’s non-adjusted version but ends up a little Stafford-y in the adjusted version. Romo — as expected — is a lot like Peyton Manning when behind, but is average or below average when ahead. 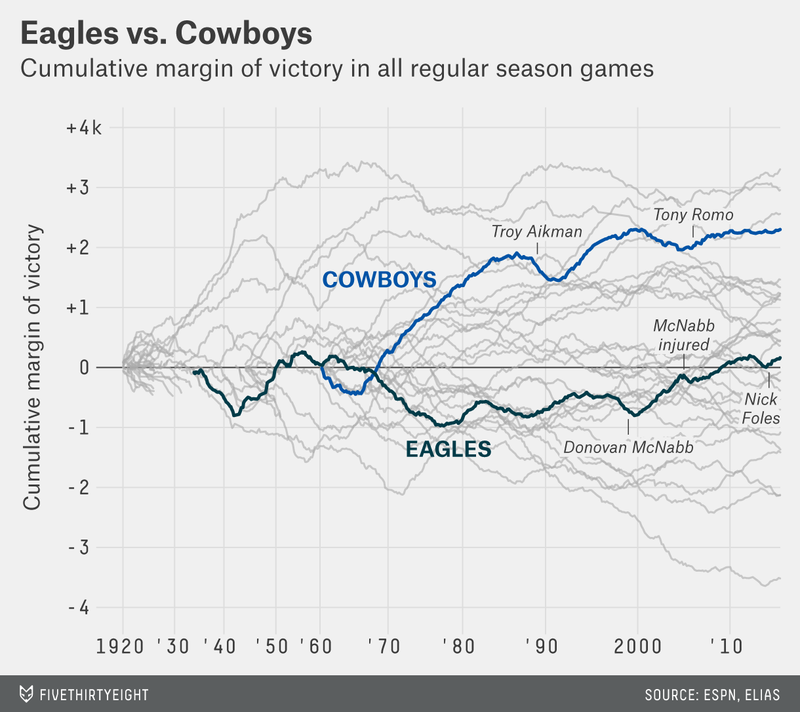 Philadelphia has a slightly higher SRS (3.7 vs. 1.6) – and, very marginally, the better recent history to corroborate that, while Dallas has home-field advantage and more of a known quantity at QB. But again, be prepared for potential comeback-y goodness when either of these teams falls behind. Since 2006, the NFL has added a prime-time game to the usual Dallas-Detroit fare, and this year it’s showcasing a rematch of last year’s NFC championship game, featuring divisional rivals Seattle (the dynasty hopefuls) and San Francisco (the original modern NFL dynasty). Presently, the two teams are battling for the NFC’s wild card spots (with Arizona their surprise divisional leader), but they’ve both been on strong trajectories the past couple of years, since the arrivals of Jim Harbaugh/Colin Kaepernick in San Francisco and Pete Carroll/Russell Wilson in Seattle. 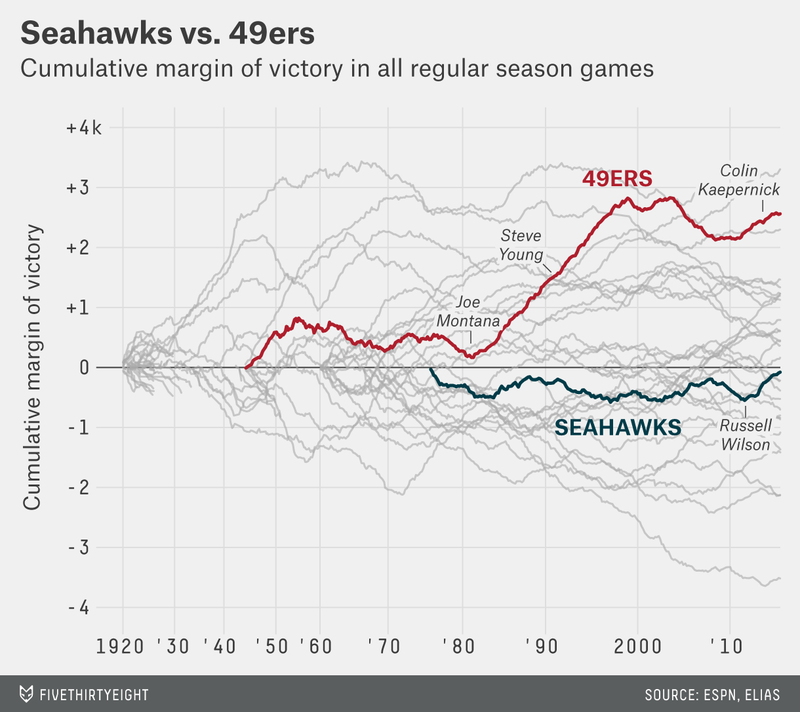 While the most dramatic effect is the amazing 1980s and 1990s 49ers run (which I discussed last week), the Seahawks trend is a great example of why I love these historical charts. From the Seahawks’ record, we know that they’ve lost more games this year (four) than all of last year (three), leading to a slight deceleration in their chart. But it’s barely even a blip in their multiyear trend. As discussed earlier, most major shifts on these charts happen for pretty transparent reasons: the departure/arrival of a great QB or coach, major injuries, etc.7 We have no such event in Seattle and every reason to think they should stay good for awhile. Wilson’s unadjusted curve, which I showed last week, looked otherworldly, but I warned that it might be partly due to the strength of the team around him — especially the Seahawks’ defense, which crushed the league in yards allowed per play in 2013. But with the defense-adjusted curves, he comes down to earth a little — to excellent but not-quite-Peyton-esque levels (note that Wilson’s curve is impossibly high on the far left as the odds ought to be approaching zero, but that’s because bad losses have been so rare for the Seahawks that the data is unreliable). He’s in a fierce competition with Andrew Luck for best win curve of the 2012 quarterback class. Kaepernick’s curve is more Romo-esque. That makes sense considering he has been featured as my Goatslinger of the Week8 for making the kinds of mistakes I like (interceptions!) at times when I don’t like them (when his team is ahead). Seattle has the far stronger SRS in this game (5.6 vs. SF’s 0.5), but it’s playing on the road. San Francisco is apparently the slight betting favorite in this one (-1 — I probably would have made it a slight underdog). I won’t say the game will be close, but it could go either way. Reminder: If you tweet questions to me @skepticalsports, there is a non-zero chance that I’ll answer them here. These charts come from the interactive graphic we introduced in last week’s Skeptical Football, which has been updated to include the latest games. OK, here’s the nitty-gritty: To do this, I took the win percentage added from all of a QB’s subsequent offensive drives and then added them to the win percentage he had at the start of the present drive (on a drive-by-drive basis). So, if his chances were 40 percent at the start of a drive and he added 30 percent between that drive and all future drives, it would count as an expected win percentage of 40 percent and an “approximated actual win percentage” of 70 percent. Note that technically these numbers can go higher than 100 percent or lower than zero percent for a given drive and situation (for example, if a QB’s defense keeps trying to give the game away, but he keeps bringing them back), but they typically don’t. I did this a couple of ways. First, as mentioned in the previous footnote, I did the analysis on a drive-by-drive basis instead of a play-by-play basis. This cuts down on the amount that a single crazy game can affect the overall analysis, because the number of drives per game is much more constant than number of passing plays. I also forced the smoother to use a “loess” (local regression) fit, so that larger samples would be treated the same as smaller ones. Also, by virtue of using win percentage added instead of binary wins/losses, we get a little additional granularity. The Cowboys were also generously aided by the infamous Herschel Walker trade/outright larceny. And yes, I’m aware that a lot of these turns also correspond to head coaching changes, but that entanglement question is a constant issue in the NFL. We can think of them as two-headed QB/coach monsters, and the analysis is mostly the same. In fact, the more I contemplate these histories, the more I suspect that QBs may be even more important to their teams than even I previously thought. Though not a fixture, I must note that the Goatslinger Award for Week 12 goes to Cleveland’s Brian Hoyer, who threw three interceptions with his team up less than a touchdown while his team still eked out the win. I’m going to covertly give the week’s Gunslinger Award to Peyton Manning, who did not have any interceptions but did futilely try and connect with some wide open receivers who could have scored him touchdowns. If you never miss a wide open receiver downfield, you probably aren’t throwing downfield enough! Too many open receivers go streaking down the field only to see the ball dumped off to some running back for a -2 yard screen. At least Manning was trying.